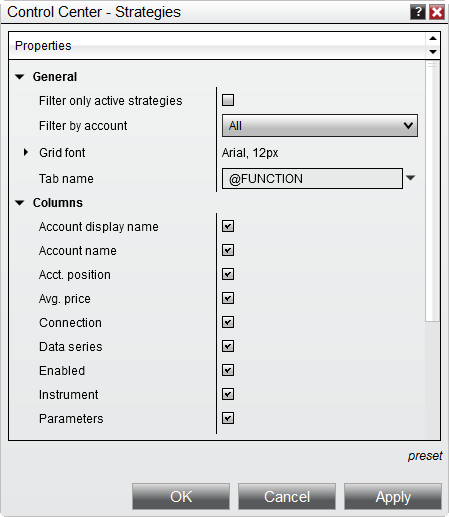 The Strategies tab displays running and terminated strategies in a data grid. Note: The IncludeTradeHistoryInBacktest property is set to false by default when a strategy is applied directly in the Strategies tab. This provides for leaner memory usage, but at the expense of not being able to access Trade objects for historical trades. Thus, fields such as SystemPerformance.AllTrades.Count that rely on references Trade objects will not have any such references to work with. If you would like to save these objects for reference in your code, you can set IncludeTradeHistoryInBacktest to true in the Configure state. For more information, see the Working with Historical Trade Data page. Active and stopped strategies are listed as a grid and can be started/stopped by left mouse clicking the check box in the Enabled column. •Green highlighted "Strategy" name indicates a currently running strategy. •Black highlighted "Strategy" name indicates a disabled strategy. Strategies using multiple instruments will be expandable so that each instrument's strategy position can be viewed. In the image above, the second strategy is using ES 06-14 as well as MSFT which is shown below it. For Multi Instrument strategies, a small red flag can appear to the right of the sync value - this would alert the user to expand the row to check the sync for any additional instruments the strategy trades as well. A checkbox indicating whether the strategy is enabled. This box can be checked or unchecked to enable or disable a strategy. The "Account Name" -- not to be confused with the "Account Display Name." These two can differ for live brokerage accounts, and the "Account Display Name" tends to be more descriptive. Tip: Please note the sync column compares only the individual strategy position to the account position, it will not generate a total strategy position for all strategies run on the same instrument / account combination. Will aggregate all strategy positions and syncs aggregate value to the accounts position for the instruments that have running strategies. Select to print either the window or the order grid area. Select to share via your share connections. While the Account Performance tab will generate performance report against your account's trade history, the Strategy Performance menu allows you to generate a performance report against the trades generated by the selected strategy. •Real-time - Generates performance data for your real-time trades only (since the strategy started running) and will exclude historical trades. If your strategy held a virtual position (calculated against historical data) upon starting, a virtual execution representing the average price of this position will be injected into the real-time results to ensure that a trade pair can be created with the executions resulting from the closing of this position. •Historical & Real-time - Generates performance data for both historical and real-time trade data. •Historical - Generates performance data for historical data only. Once you have your properties set to your preference, you can left mouse click on the "preset" text located in the bottom right of the properties dialog. 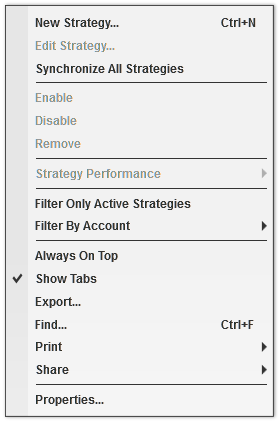 Selecting the option "save" will save these settings as the default settings used every time you open a new window/tab. If you change your settings and later wish to go back to the original factory settings, you can left mouse click on the preset text and select the option to restore to return to the original factory settings - please note though that you cannot save a custom default to restore to. Note: A number of pre-defined variables can be used in the "Tab Name" field. For more information, see the "Tab Name Variables" section of the Using Tabs page.